Are flags, as symbolic statements, additive? I ask this because of three flags whose valences seem to differ considerably, depending on who is viewing them. The Gadsden flag flies over every post at ChicagoBoyz, where myself, Zen. Lex and other ZP friends sometimes post, and I don’t believe the ChicagoBoyz approve of racism, so though it may connote a right-leaning position on small government, it’s meaning if carried beyond that would seem to be up for individual grabs. In recent years, the Gadsden flag has become a favorite among Tea Party enthusiasts, Second Amendment zealots—really anyone who gets riled up by the idea of government overreach. It’s also been appropriated to promote U.S. Soccer and streetwear brands. And this reflects a deeper question, one that’s actually pretty compelling: How do we decide what the Gadsden flag, or indeed any symbol, really means? One answer involves history. The Gadsden flag is one of at least three kinds of flags created by independence-minded colonists in the run-up to the Revolutionary War, according to the writer and historian Marc Leepson, the author of “Flag: An American Biography.” Liberty flags featured that word on a variety of backdrops; the Pine Tree flag floated the slogan “An Appeal To Heaven” over a depiction of a pine tree. Neither endured like the design of Christopher Gadsden, a Charleston-born brigadier general in the Continental Army. His was by far the coolest, with its menacing rattler and provocative slogan. Good. I’m a Brit, but I can handle an anti-British flag, even if I’m nursing the wounds of loss of Empire. After a thorough review of the record, it is clear that the Gadsden Flag originated in the Revolutionary War in a non-racial context. 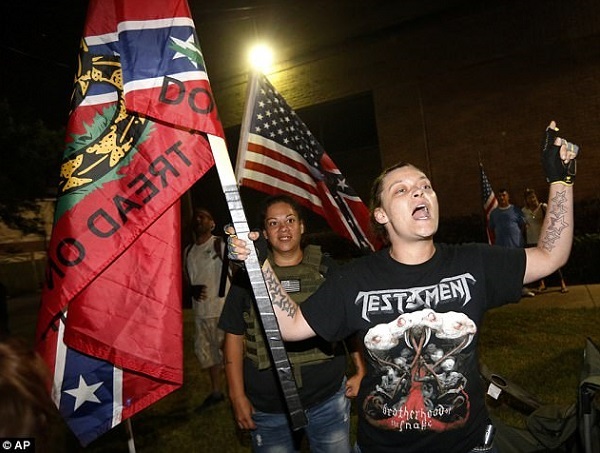 Moreover, it is clear that the flag and its slogan have been used to express various non-racial sentiments, such as when it is used in the modern Tea Party political movement, guns rights activism, patriotic displays, and by the military. However, whatever the historic origins and meaning of the symbol, it also has since been sometimes interpreted to convey racially-tinged messages in some contexts. Hey, the New Yorker is right — the Gadsden flag does indeed have “Shifting Symbolism”. Are the two flags additive? 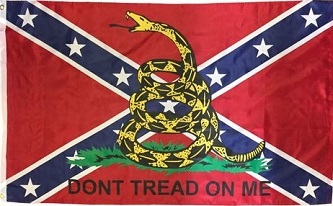 I’d be interested to see a fuzzy-logic Venn diagram of the overlap of meanings between Gadsden and Confederate flags. 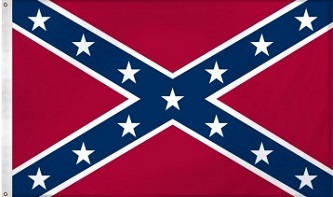 Is there a single correct interpretation of any of the three flags (Gadsden, Confederate, & Gadsden-Confederate) that are my topic here? How would we even decide? I’m aware that this is a delicate topic, and would request civil responses from both sides of the aisle, both sides of the police barrier, you know what I mean. As a Brit, again, I can benefit from exposure to views of different (stars and) stripes. Speaking of which, I’m no great admirer of Bill Maher, who is too snide to be considered much of a wit in my book — but this little jewel of an aphorism may be the best haiku-like summation of Remainer’s regret I’ve seen. Civilization requires civility — and polarization seems to encourage incivility on both sides of many, many issues. Sorry, folks.